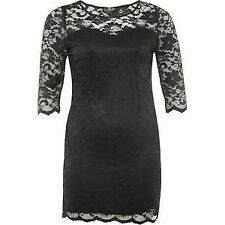 Diesel Womens Lace Crotchet Cream Dress Size Large. Best fit size 12. Brought from Vestiaire collective. Was worn once by the owner but has never been worn by myself. Great condition. Has a slip for underneath the dress. Roman Originals Womens Lace Flapper Tassels Dress in Black Sizes 10-20. Blue Lace Bardot Dress. 16. Very. Midi. maje blue lace midi dress with slip size1 UK8/101wirn once! RRP £340! An elegant addition to your wardrobe, browse women’s lace dresses to add some beautiful pieces to your collection. From little lace trims to full lace dresses, choose the best dress for you. A timeless classic, lace never goes out of style, whether you choose to opt for a vintage look or add a smart and chic modern twist. Lace is a beautiful, decorative fabric that can be made from a whole range of fibres from nylon and polyester to cotton, linen, wool and silk. 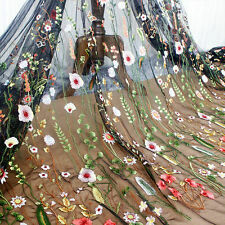 Lace is transparent with an elegant pattern made by looping, plaiting, braiding or twisting the threads together. Lace is such a classic style that it’s easy to add to your wardrobe. If you’ve not really worn lace before and want to ease yourself in, choose plain dresses with lace trims or dresses with a lace overlay to the bodice to add an elegant little touch. 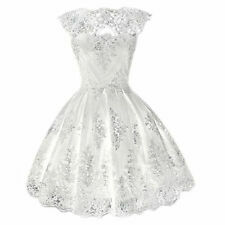 If you’re going full lace, embrace the vintage style with cream lace, or mix it up by choosing a range of colours. When buying transparent lace, the ideal way to wear it is by layering either over or under the dress. Choose a plain slip to wear underneath or wear a jacket over the top – leather or denim perfectly contrast the elegance of the lace. If your lace is unlined, play about by mixing and matching coloured slips, giving you a new look every time you wear. Plain dresses with lace details and trims are a great way to insert beautiful lace into your look. Lace details at the bust and waist add vintage-inspired and provocative accents to your look. Or opt for a modern-style vintage look with a pretty lace collar. Keep any accessories simple, lace doesn’t want to be overcrowded, it is beautiful and elegant in its own right. For a smart look, try wearing a tailored blazer over your lace dress.